The inlay or onlay is a prosthetic component, usually made in ceramic, but also in composite or gold. When the caries is so extensive that the classical amalgam or composite repair is not possible, than the inlay or onlay are the solution. 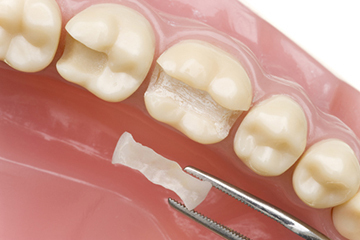 Inlay and onlay restore the very damaged or broken tooth and their role consist in preserving the tooth and the pulp. If there is a significant lack of dentin than the tooth is reconstructed using the onlay, while the inlay that is smaller can only replace the substance that is loss due to caries. After taking the imprint of the cavity that needs to be filled, the technician fabricates the missing part of the tooth. Nowadays, thanks to the CAM (Design and Computer Assisted Manufacturing) it has become possible to fabricate the missing part by using the machine tool which makes it very precise. In Serbia the price of an inlay is 22 Euros and of an onlay 26 Euros, which are the lowest prices in the world.